In many nations around the world there is a struggle currently going on between two very different paradigms for educating children. The dominant system has been in place for over a hundred years. It is sometimes called the “factory model.” This is where schools are set up to administer “essential knowledge” to large batches of same-age children simultaneously. After instruction has been completed the children are tested, to see how much of the knowledge they were able to understand and remember. This system is based on the way factories and scientific experiments were designed at the beginning of the last century. 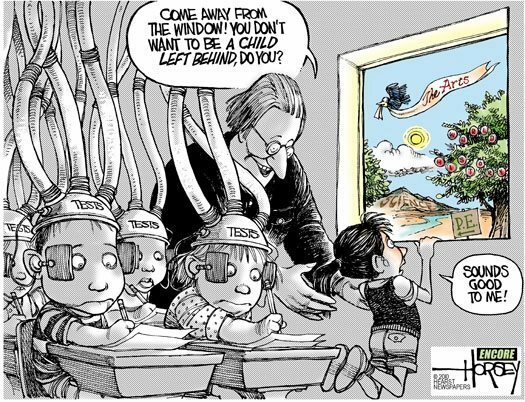 While on the surface this approach seems to be about transmitting “knowledge” to children there is also an unspoken “hidden curriculum” being taught. As John Taylor Gatto has written, such schooling teaches youth to obey authority, to comply with instructions, to be willing to engage in difficult activities that often seem meaningless, and to accept that society is comprised of people with different levels of talent and social status. Over the last decades, research in education and child development indicates that the factory model is based on several faulty assumptions. It assumes that learning can be measured by standardized tests, and that all children will learn at the same rate and in the same manner. This is just not true. The fact that children learn best when something is meaningful, enjoyable and interesting for them is ignored. The importance of learning in groups and from slightly older children is also not considered relevant. As Ken Robinson has described in his TED talk “Changing Education Paradigms“ (with over 12 million views) the industrial model of education is a form of social engineering that has created many problems in our world. It does not fit with the natural way children actually learn. It does not reward creativity, innovation, independence, compassion, intuition, confidence, cooperation and many other essential character strengths, instead fostering social dysfunction, alienation and (for countless people over the last hundred years) a sense of personal failure and incompetence. In a somewhat subversive way, the love of learning and natural curiosity that children bring into this world is being re-programmed, so that they can be taught to work hard in order to please others, and to do things for utilitarian reasons, to obtain external rewards and status, rather than intrinsic happiness. Factory schools are designed to divide children into the categories of winners and losers, thereby creating a social “underclass” of potentially bright learners, who become unmotivated and unskilled. Those with low skills, status and self-esteem are then drawn toward harmful activities, such as gangs, crime and illegal drugs. Just as troublesome, “approved” drugs are now being given to children to force compliance and attentiveness in schools, the future consequences of which are unknown. It’s a model of education that seems straight out of George Orwell’s 1984 or Aldous Huxley’s Brave New World, designed to produce obedient workers for the modern industrial economy of the last century. In effect, its more like a method for manufacturing future robot workers then for nurturing true creativity, independence, skillfulness and learning. 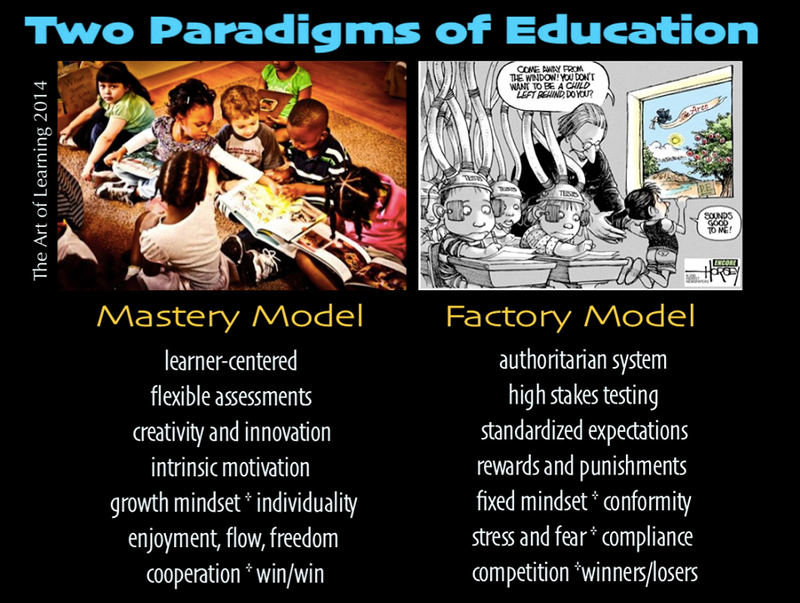 Interestingly, alongside the creation of the factory model a very different educational paradigm has also co-existed. This is sometimes called learner-centered education, or the mastery model. Maria Montessori‘s schools were set up this way, beginning with the assumption that children must be in control of their own learning, and that the happiness of the child is a sign that education is effective. Adults shape the learning environment, but in a way that encourages exploration, curiosity, creativity, autonomy and skill mastery. Similar approaches have arisen over the last decades, proving themselves to be successful with previously unmotivated learners. Since the late 1980s, Stanford Prof. Hank Levin’s Accelerated Schools implemented a learner-centered model. There is also Project Zero, developed by Howard Gardner at Harvard, and Yale’s Dr. James Comer’s School Development Program, which has proven its effectiveness since the late 1960s. Most well-known, the learner-centered paradigm has been implemented successfully in Finland, a nation respected by educators around the world. The question then arises, if the learner-centered model has proven itself to be so effective, and the high-stakes testing approach of the factory model has not, why is this model still dominant in many “leading” nations around the world? Why are so many business and government leaders in nations like the United States, Japan, Britain and Korea obsessed with test scores and international rankings? Are they not aware of the social consequences of this approach? As a long-time educator living in Japan, I have seen the effect of the factory model first-hand. Students in Asia do very well on standardized tests, but at what cost? As Yale lecturer Se-Woong Koo described in the NY Times, in South Korea, there are high rates of suicide, physical illness and depression associated with education pressures. In China, (see this CNN news video), some students are being given medical drips in their classrooms, to help them study all day without passing out. Here in Japan my sons and their friends have gone to cram schools to memorize volumes of “facts,” only to forget most of the information within a year or so. Even in the “top” high schools, the students are expected to cram English grammar and vocabulary into their heads, without being given any opportunity to actually develop the communication skills that would allow them to use it. While observing this for the past twenty years, I have also implemented the learner-centered model both in my classrooms and at home with my sons. I think most parents are familiar with this approach, for this is how we have encouraged our children to master skills outside of school. Although they went through the Japanese system, both of my sons are bilingual because we gave them opportunities to practice and enjoy the language during trips abroad to the U.S., by watching movies together, reading books, listening to music and communicating with me at home. Self-direction, collaboration with others and enjoyment are keys to learner-centered education and skill mastery. Children have to be interested in what they are learning and have ample opportunities to practice and apply an area of knowledge in order to deeply comprehend what they are learning and develop real skills and competence. I think we’ve all seen this with sports, crafts, hobbies and art forms we and our children have mastered. Tests had little to do with our success, it was the love of learning and the desire to master something that encouraged us to develop our skills. To emphasize a successful learning approach at home and an ineffective system in schools is foolish. The research evidence is there. We know what we have all observed in our own lives. We’ve seen the success of Montessori schools, Finland’s approach, the programs of educational leaders like James Comer, Hank Levin, Howard Gardner and others. What then is the problem? To continue with high-stakes testing and the socially dysfunctional approaches of the factory model borders on educational malpractice, in my opinion. While corporate leaders, test-making companies and government leaders want to update and maintain this model, the majority of parents and teachers know better. With it’s authoritarian emphasis on compliance, competition and testing the factory model is obsolete, undemocratic and de-humanizing. It’s a relic of our past, that needs to be dismantled and retired as we move into the 21st century. Ken Robinson – Bring on the Learning Revolution! This entry was posted in Creative Systems Thinking and tagged accelerated schools project, creative systems thinking, education reform, Howard Gardner, james comer, learner-centered education, love of learning, new paradigm, school reform, self-direction. Bookmark the permalink. Thank you for sharing this piece. Factory education is the reason I’m homeschooling my child. I absolutely do not want her independence, curiosity and ability drilled out of her. Can I please translate this article into Portuguese to share on my blog Educar em Família? How do I contact you or follow this blog? I didn´t find any buttons. Thanks. Yes… I’m happy if you do. This article resonates with me for a plethora of reasons and I absolutely concur with you that the contemporary educational system is fundamentally flawed with business and science approaches to learning. As I continue to progress through my intellectual journey, I am conscious that a dominant culture in power wants to stay in power. It would not create self-destructing mechanisms to defeat itself. It uses education as one of its weapons to stay in power. Therefore, this factory paradigm would not retire because it helps to maintain the status quo. 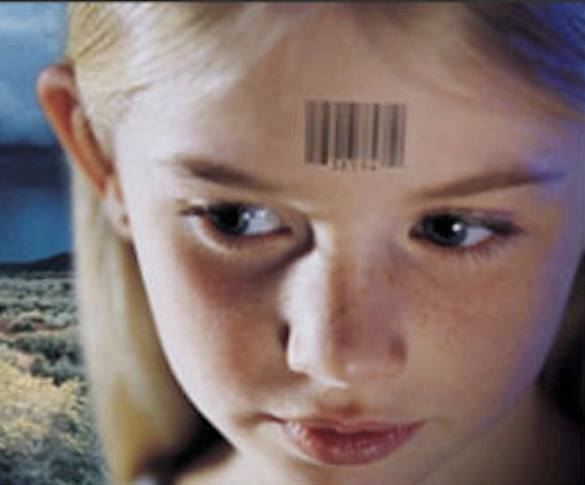 This industrial and social engineering model has continued to inflict deep wounds to administrators, educators, teachers, parents, and students. It would die only when we, collectively, decide to confront and challenge this inefficient and effective teaching and learning method. One way to do so is for us to become ardent researchers and develop models and present clear and convincing evidence that our system needs to change. It may be instructive to become informed about the Sudbury Valley School (www.sudval.org), now nearing 50 years in operation as a self-funded, democratic school where young people are free to pursue their interests, and play, learning most about those things that become important to them. Sudbury and its sister schools around the world, including now in Japan, are learning communities. I am currently in the process of switching to a homeschool format for my son. Surprisingly, the principal of his school is in full agreement that it is necessary at this time. We have been through a lot of trauma, he and I, and as tough as it has been for me to recover from it, he is struggling even moreso. The normal mode of “punishment” or “consequences” such as a reduction in privileges, rights or rewards do not have the same impact and can be highly counterproductive in a child that has already experienced losing everything even when he didn’t do anything wrong. Children who have been homeless, need an entirely different approach to education. I sincerely hope that as a society, we come to terms with the effects of trauma on child development and act accordingly. I agree 100% with your approach. No education model will succeed if not guided by compassion and real love for each child. I agree with you completely and was fine homeschooling rather than signing my child into such a flawed system. Homeschooling has many benefits and I never thought about how the flexibility improves your family’s quality of life by being able to slow down and take care of individual needs. I would have thought the opposite. Anyway we are homeschooling middle and high school now ending in the same place as traditional folks with less trauma and still a love of learning.